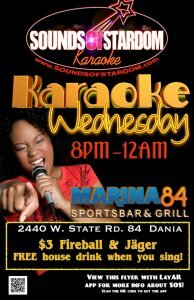 Every Wednesday Night Sounds of Stardom hosts as you unleash your inner ROCKSTAR!!! Karaoke Begins at 8 pm and Each and Every particpant recieves a complimentary house cocktial with great $3 Jager & Fireball specials & $5 House wines all night!! Here at Marina 84 Sports Bar & Grill you are the star! So come showcase your talent & Skills as Sounds Of Stardom provides a music selection of over 1000s + songs.